This is the highest point in Nanaimo, at 1000+ meters (3,300 feet). There is no rock climbing required to reach the top. The peak is a wide area, not steep - it's quite safe. It's a great place to spend some time after a long climb. On the north side of the summit, there is an area with old growth trees. It's an interesting area, quiet and mysterious - very much worth visiting. There are some wonderful lookouts all over this mountain, most of them off the beaten track. There are several routes to the summit, but the quickest and most straightforward begins at Witchcraft Lake (see the map below). The views from the top are phenomenal: You can see one third of the Salish Sea, across to Vancouver and its mountain ranges, north to Texada Island and south to Duncan. Or you can turn around and look inland, across the wilderness toward Port Alberni and Bamfield, and the open Pacific (I think you can see a PIECE of the open ocean to the west, between some peaks). 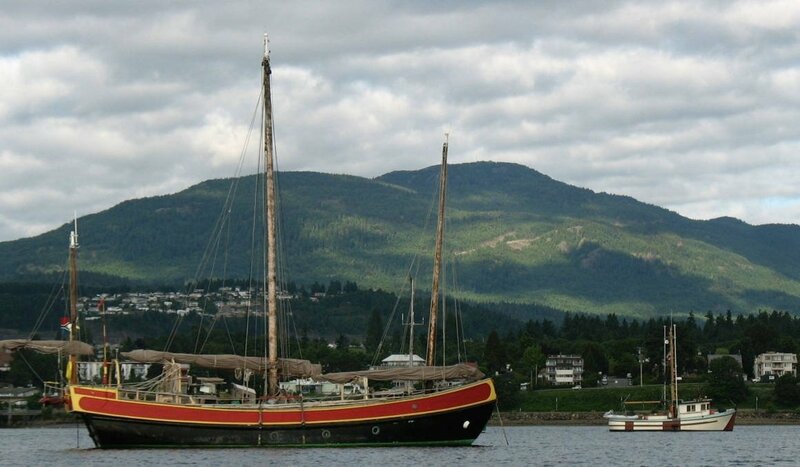 The mountain was called "Wakesiah" in Nanaimo's early days (I believe the name was used by the local First Nations), but it was later renamed in honour of Alfred Benson, the resourceful and adventurous Hudson's Bay Company doctor who was stationed here in the 1850s and 60s.